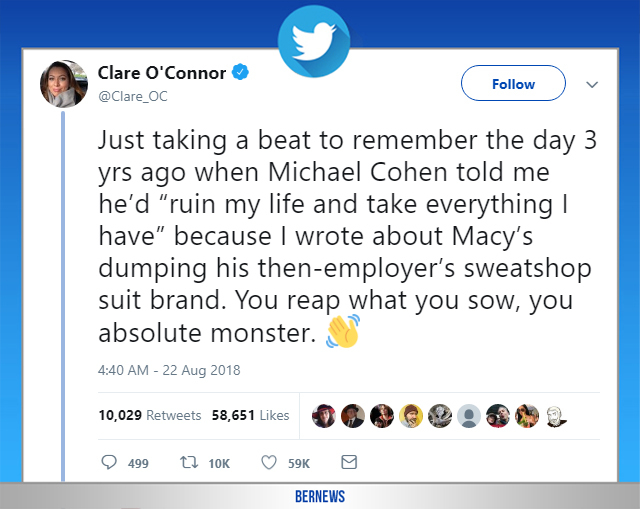 A tweet by Bermudian journalist Clare O’Connor about her negative experience with Michael Cohen went viral, with some 70,000 reactions on the social media network. After the story in 2015, President Trump — who was then a candidate for President — tweeted about it and as seen in the screenshots below, he mentioned Ms O’Connor in five tweets, using his standard style of criticizing the reporter and media outlet following a news story. 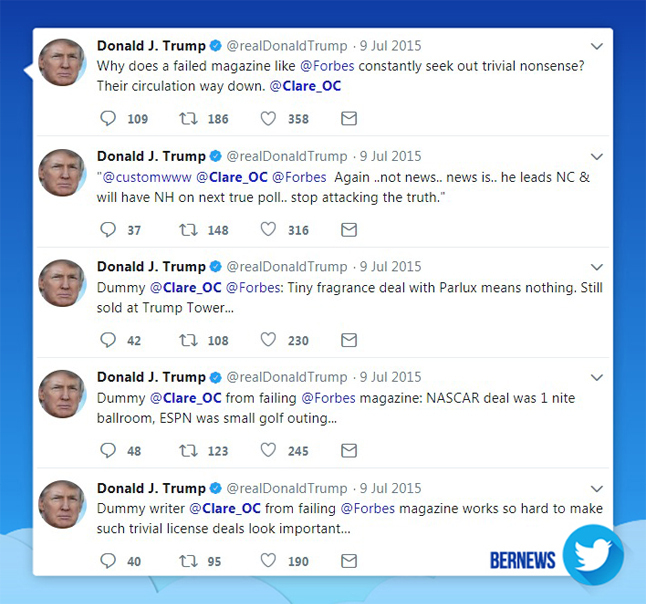 The Bermudian journalist is one of many reporters who the U.S. President has criticized, with President Trump frequently complaining about the media, and even labeling the press as the “enemy of the people” on multiple occasions. Ms O’Connor’s tweet came on a dramatic day of developments in U.S. politics, as the New York Times reported, ”Michael D. Cohen, President Trump’s former lawyer, made the extraordinary admission in court on Tuesday that Mr. Trump had directed him to arrange payments to two women during the 2016 campaign to keep them from speaking publicly about affairs they said they had with Mr. Trump. I never liked the guy going way way back..never impressed by is name on Buildings, Planes, and clothing…always thought TRUMP was so TACKY. hope he enjoyed his stay at 1600 Pen Ave!